Pret opened in London in 1986. College friends, Sinclair and Julian, made proper sandwiches avoiding the obscure chemicals, additives and preservatives common to so much of the 'prepared' and 'fast' food on the market today. The two of them had woefully little experience in the world of business. They created the sort of food they craved but couldn’t find anywhere else. Because Pret is private we don’t face the same pressure to grow that a public company does. We will develop slowly, one shop at a time. 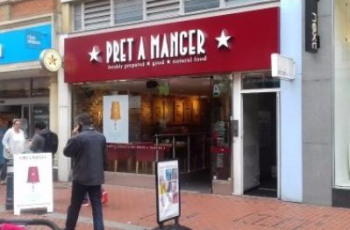 There are about 240 Pret shops at the moment!